A classic Christmas leftover traybake with all the trimmings. 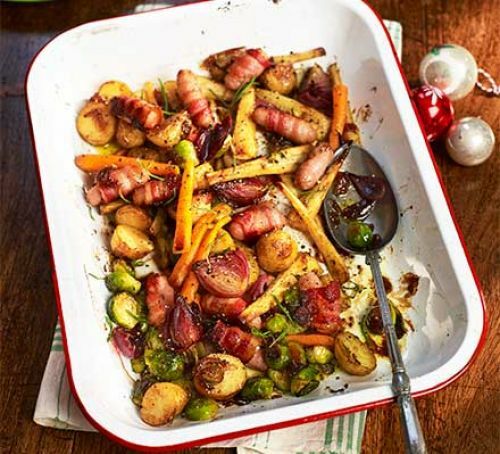 Whether it’s a Boxing Day feast for using up leftovers or you’re looking for an easy to make and easy to follow festive recipe – then this is for you! Heat oven to 200C/180C fan/gas 6. Mix the oil and chutney together and season well. Divide everything except the sausages and herbs between two large roasting tins, pour over the oil and chutney mixture and toss together. Put both trays in the oven for 25 mins. Add the sausages and herbs to the trays and bake, stirring halfway through, for 30-35 mins more or until the vegetables are soft and the sausages are cooked through. If one tray is browning more than the other, swap them around.